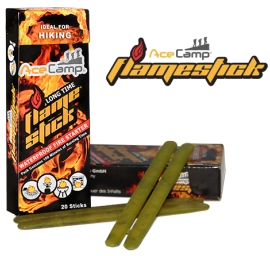 The waterproof odorless firestarter sticks are practical for everyday use both indoors and outdoors. They are cylindrical with a rectangular cross-section adapted for safe ignition when lit. The flame produces minimal amounts of smoke, making it safe to use in closed spaces. Each box weighs approximately 40 gram weight with 100 minutes of burning time. They are resistant to moisture, and easy to ignite.